Bringing a distinctly tropical, Caribbean influence into the resident avifauna of extreme southern Florida, the White-crowned Pigeon (Patagioenas leucocephala) is one of the few species that have managed to colonize the southern tip of the state from the Greater Antilles and the Bahamas — the center of its range, although there are also populations in coastal Mexico, Central America, and the Lesser Antilles. With a family renowned for its strong flight and capability to colonize far flung locations (such as the Imperial-Pigeons and Fruit-Doves of the Tropical Pacific, Blue Pigeons of the Indian Ocean, or endemic pigeons of the Canary Islands), this fact comes to no surprise. Nonetheless, this bird is one of the most interesting species in the avifauna of southeast Florida for many reasons — an interesting biology that parallels that of several pigeon species in the Old World Tropics as well as its limited distribution in the state. I will conclude this article with tips on how and where to see White-crowned Pigeons on your next trip to southeast Florida. White-crowned Pigeon biology is convergent with that of other pigeon species. This obligate frugivore depends on two different habitats for survival — mainland, tropical hardwood forest for feeding and offshore islets for semi-colonial nesting. 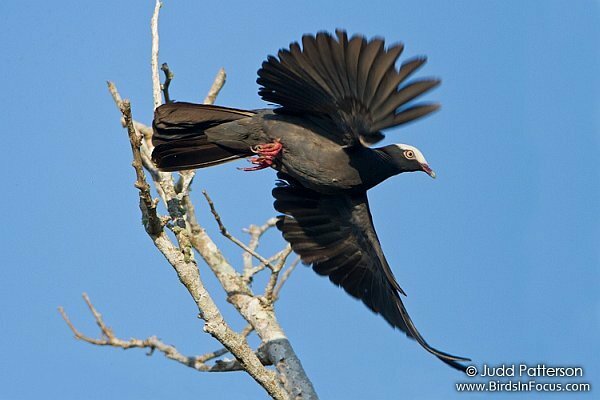 During spring and early summer, White-crowned Pigeons can be seen streaming overhead into Florida Bay by the hundreds in the afternoon at Flamingo in Everglades National Park. Although their movements are not clearly understood, numbers of birds seem to drop sharply in fall and winter, and the remaining birds are far less conspicuous along the trails crisscrossing the mangroves and tropical hardwood forests in the park. This aspect of their biology closely mirrors that of the Torresian Imperial-Pigeons of northern Australia, another obligate frugivore that nests on offshore islands and feeds on the mainland. During spring and summer, hundreds or even thousands of these black-and-white pigeons can be seen flying out into the Coral Sea in the late afternoon. Like their New World counterpart, most of the imperial-pigeons leave for the winter. Is this the closest equivalent to a tramp species in the Americas? Further illustrating their convergence with imperial-pigeons, White-crowned Pigeons has some of the characteristics of a tramp species. In biological terms, a tramp species is a wide-ranging colonist that successfully inhabits only species-poor small islands yet are rare or non-existent on the mainland. This wide-ranging columbid is strictly coastal in Mexico and Central America, restricted mostly to barrier islands and the immediate coastline. 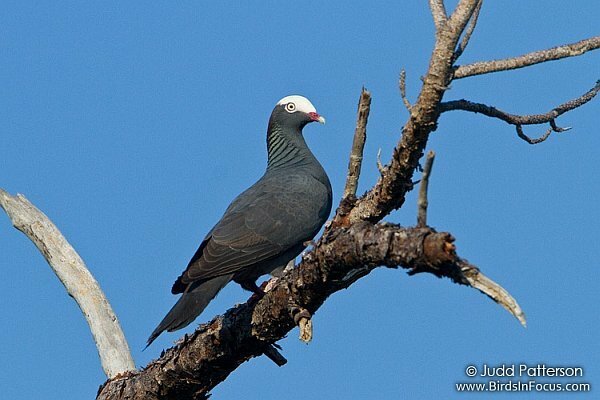 In the Greater Antilles, the Scaly-naped Pigeon, Plain Pigeon, and Ring-tailed Pigeon (endemic to Jamaica) inhabit mostly upper elevation forests while White-crowned Pigeons are restricted to the coast and mangroves. However, in southeast Florida where there is no other native, frugivorous pigeon, this species also inhabits and breeds at inland locations such as Kendall Indian Hammocks which is over ten miles inland. If you hear a loud wing-clapping noise while hiking a trail, you likely just scared off your life White-crowned Pigeon. Finding this pigeon in the spring and summer is fairly straightforward in the Florida Keys, where it is an abundant species found commonly throughout from Key Largo to Key West. Mornings and late afternoons seem to be the best times to see these pigeons as they commute to and from their roosting or nesting sites to feeding areas. As previously mentioned, Flamingo in Everglades National Park can be especially good in the afternoons when you can witness the spectacle of seeing hundreds of these pigeons flying back to offshore islands for the night. For those who can only visit in winter or can only bird the mainland, White-crowned Pigeons can still be reliably seen (although not guaranteed) at several sites such as A.D. Barnes Park, Kendall Indian Hammock, Bill Baggs State Park, and the neighborhood just north of Kendall-Baptist Hospital (of bulbul fame). Birds at these sites are not as skittish as those found within Everglades National Park and will allow a closer approach for better views and photography. Also, take note that this species does not occur regularly north of downtown Miami, as the climate and vegetation north of the city begins to take on increasingly more subtropical characteristics that are not to its liking. Hopefully, this information will be useful to those having trouble seeing this fascinating species and to further appreciate it when they finally manage to do so. 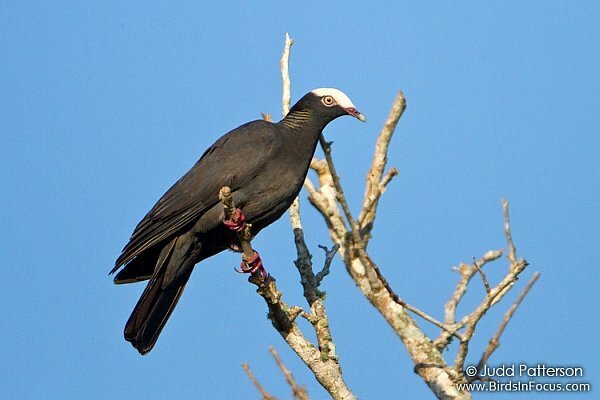 If you would like to make a trip to southern Florida in search of Caribbean specialties such as White-crowned Pigeon featured in this article, exotics, or general birding, please visit my webpage at www.ecoavian.com or contact me by email at csanchez1230@gmail.com to inquiry about my guiding services. I just saw this bird on Singer Island, FL…Palm Beach Shores. Is this possible? Hi Rose. Yes, it is unusual but not heard of for White-crowned Pigeon to show up in Palm Beach. I believe Brian Hope, a long time birder of that county, saw one at Spanish River Park in early March of this year. Hi Carlos, I guess we were lucky to see it. Thanks so much for responding. Hi Carlos.. I live outside of Moore Haven, Fl, rural & no neighbors.. Starting a pigeon loft & wondered about flying & homing white crowns. I always loved seeing them in Andros, wondered if I can loft them, & mix with other pigeons?.. Are they legal to own? They are not legal to own.